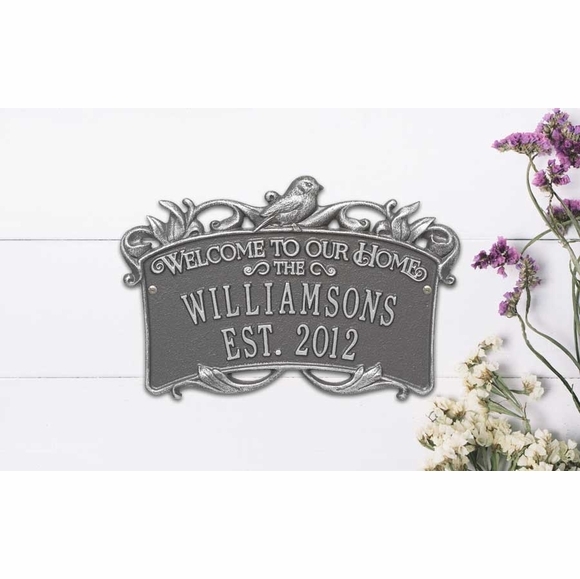 Welcome To Our Home Plaque - - custom made Songbird Welcome sign. Unexpected ribbon shape resembles a crown. Includes elaborate scroll work accents, nesting songbird, and two lines of personalized wording. Made in USA. 14.25" x 9.5" personalized wall Welcome sign. Lines of wording follow the graceful ribbon shape. The lines that say WELCOME TO OUR HOME and THE are standard and part of the sign's design. Line 2 also holds up to twelve (12) 1.25" characters. Large image shown in pewter with silver characters. Smaller images (from left to right) are antique brass, antique copper, black/gold, bronze verde, oil rubbed bronze, bronze/gold, and pewter/silver. Dimensions: 14.25"W x 9.5"H x .34". Silhouetted Bird and Branch design in the shape of a large ribbon welcomes friends to your home. Wall mount. Made in USA.